In a proud and noble tradition stretching back a whole two years, NASA yesterday did Black Hole Friday, rather than just flogging a few Apollo mini-figs for 25 percent off. We got science, we got knowledge, and of course, a bunch of jaw-dropping images of black holes. Here are the best. The magenta spots in this image show two black holes in the spiral galaxy called NGC 1313, or the Topsy Turvy galaxy. Both black holes belong to a class called ultraluminous X-ray sources, or ULXs. The magenta X-ray data come from NASA's Nuclear Spectroscopic Telescopic Array, and are overlaid on a visible image from the Digitized Sky Survey. Astronomers using NASA's Hubble Space Telescope may have found evidence for a cluster of young, blue stars encircling HLX-1, one of the first intermediate-mass black holes ever discovered. Astronomers believe the black hole may once have been at the core of a now-disintegrated dwarf galaxy. In this artist's illustration, turbulent winds of gas swirl around a black hole. Some of the gas is spiraling inward toward the black hole, but another part is blown away. Artist's view of the M60-UCD1 black hole. The black hole is five times the mass of the one at the center of our Milky Way galaxy. It is inside one of the densest galaxies known to date — the M60-UCD1 dwarf galaxy that crams 140 million stars within a diameter of about 300 light-years, which is only 1/500th of our galaxy's diameter. 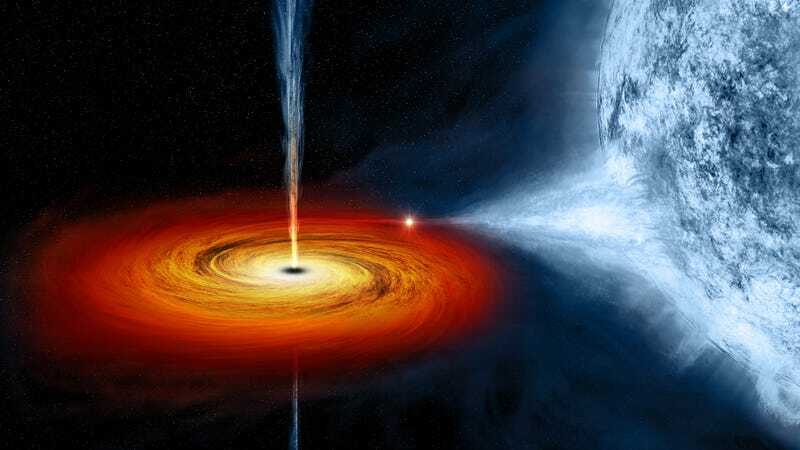 This artist's concept illustrates what the flaring black hole called GX 339-4 might look like. Infrared observations from NASA's Wide-field Infrared Survey Explorer (WISE) reveal the best information yet on the chaotic and extreme environments of this black hole's jets. In the direction of the constellation Canis Major, two spiral galaxies pass by each other like majestic ships in the night. The near-collision has been caught in images taken by NASA's Hubble Space Telescope and its Wide Field Planetary Camera 2. The larger and more massive galaxy is cataloged as NGC 2207 (on the left in the Hubble Heritage image), and the smaller one on the right is IC 2163. Strong tidal forces from NGC 2207 have distorted the shape of IC 2163, flinging out stars and gas into long streamers stretching out a hundred thousand light-years toward the right-hand edge of the image. On March 28, 2011, NASA's Swift detected intense X-ray flares thought to be caused by a black hole devouring a star.